Wednesday 9 September marked the day our Queen, Elizabeth II, became the longest ruling monarch in British history, taking the title from Queen Victoria. 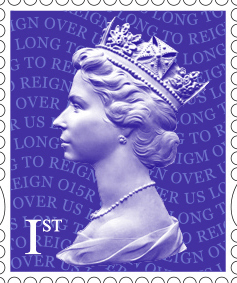 To commemorate this occasion Royal Mail released a new stamp issue ‘Long to Reign Over Us’. Above you can see the Miniature Sheet, issued with images of both the Wyon Medal, on which the original Penny Black was based, and the three-quarter portrait of the Queen by Dorothy Wilding. The Amethyst Machin definitive in the centre includes the words ‘Long to Reign Over Us’ in the background of the stamp. To mark this momentous occasion I thought we should take a moment to look at some stamps that document milestones of the Queen and her predecessors. Queen Elizabeth is the 40th monarch since William the Conqueror and will become the longest ruling by surpassing the 63 years and 216 days amounted by Queen Victoria. In 1952 Elizabeth inherited the throne from her father, King George VI, who became King in 1936 as the result of his brother’s abdication to marry American socialite Wallis Simpson. 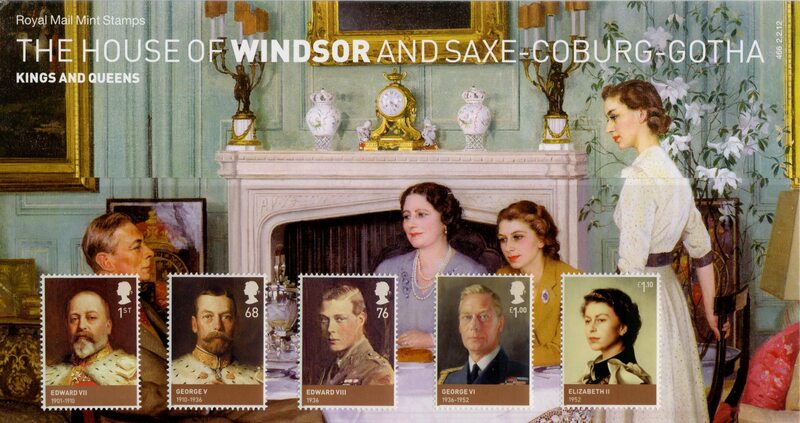 We can see the family line of succession in the stamp issue of 2012 depicting the House of Windsor and Saxe-Coburg-Gotha. During the Second World War Elizabeth trained as a driver in the Women’s Auxiliary Territorial Service (WATS) to serve her country. It was here she learnt to change tyres, rebuild engines and drive heavy vehicles. 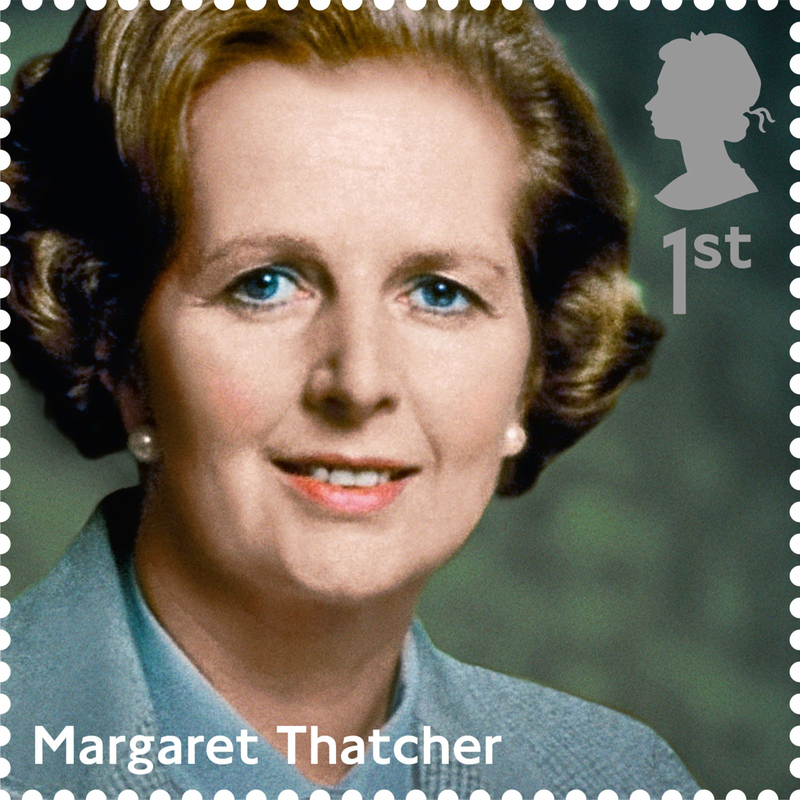 We can see an image of her during this period in the centre of the below stamp. Elizabeth married Philip Mountbatten in 1947 and had two of her four children before her coronation; Charles in 1948 and Anne in 1950. It was on a trip to Kenya in 1952 that she became Queen, though she was not officially crowned until a year later. It was the first time the ceremony was broadcasted to the nation, allowing everyone to celebrate the event. During her reign the Queen has had two children, eight grandchildren and now five great grandchildren. As monarch, much of her life, and that of her children, has been spent in the public eye and over the years we have seen stamps document the marriages of all the Queen’s children, most recently her grandson Prince William. The Queen has ruled through difficult times; with social unrest, conflict and the possibility of a split nation. During this time she has also made numerous changes to the monarchy; from opening up her residences to the public to supporting the end of male primogeniture. She has presided over 12 Prime Ministers including Winston Churchill, Margaret Thatcher and Tony Blair and has visited countries across the world. Her Royal Highness has devoted her life to her country, performing over 60 years of service. 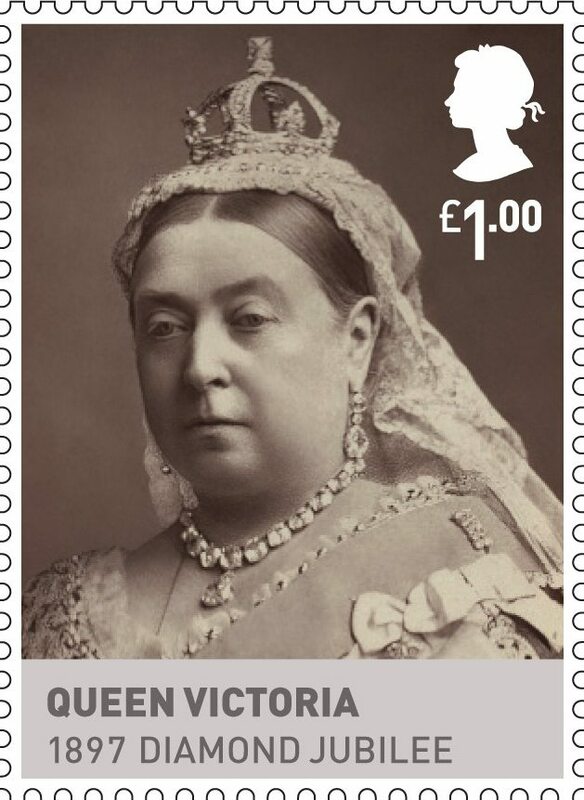 It is through the commemorative stamps of her reign that we can see the development of her life and that of her decedents. In a time when the popularity of the monarchy is suffering, one must acknowledge her dedication and continued love of her country and through ‘Long to Reign Over Us’ we celebrate this. 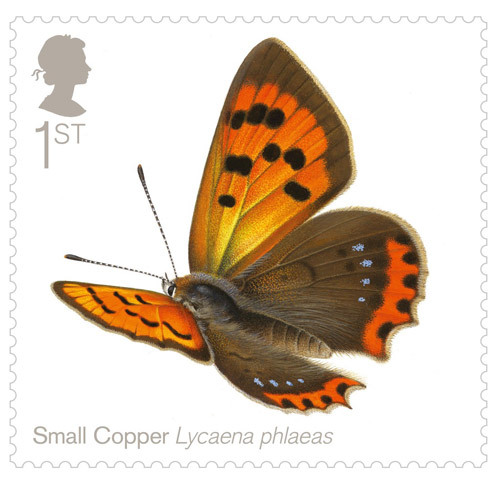 Butterflies are a topic popular with stamp collectors and the public alike. 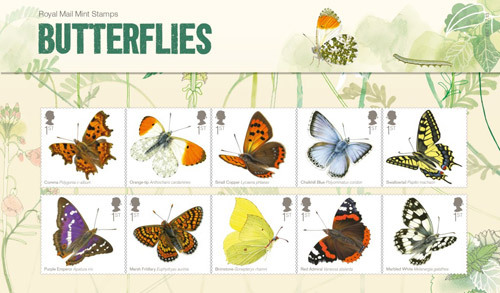 A Butterflies issue from Royal Mail, available from today, celebrates the British love of butterflies on 10 beautiful stamps. 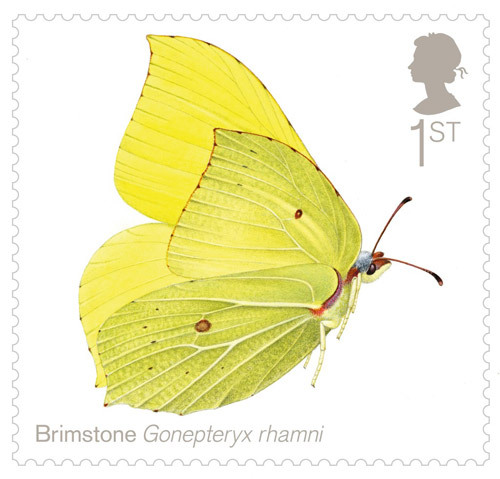 The last time Royal Mail issued a set of stamps devoted to butterflies was 1981; hence it was high time that subject was returned to. 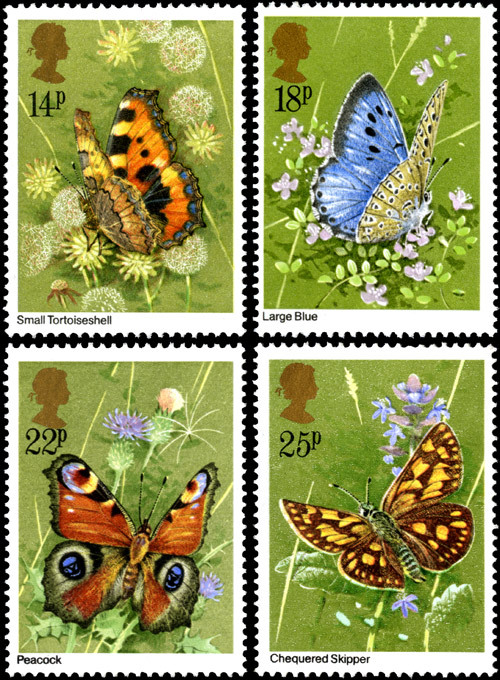 Butterflies stamps issued 13 May 1981. 14p – Aglais urticae, 18p – Maculinea arion, 22p – Inachis io, 25p – Carterocephalus palaemon. 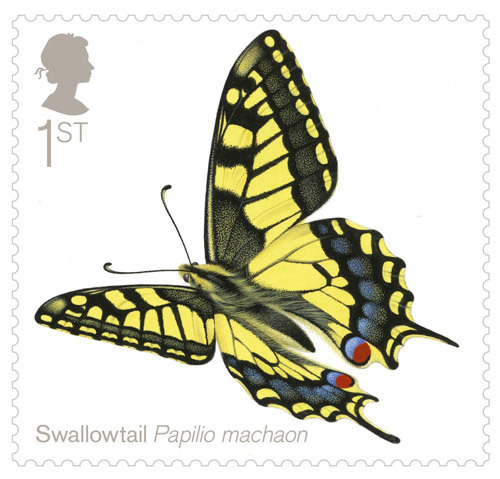 To create a brand new special issue, Royal Mail turned to renowned artist Richard Lewington. 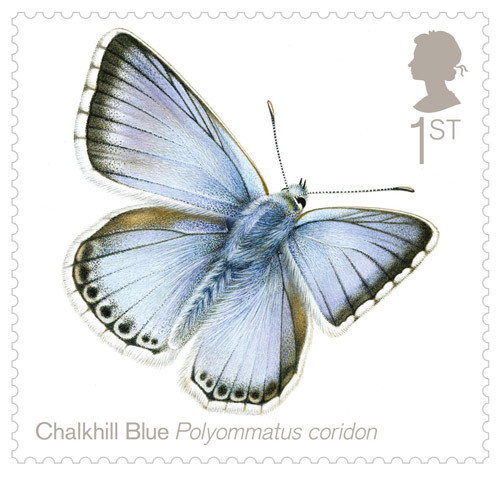 The 10 UK species of butterflies chosen are a mix of endangered and the more common and familiar, and the delicate illustrations depict these beautiful creatures to stunning effect. 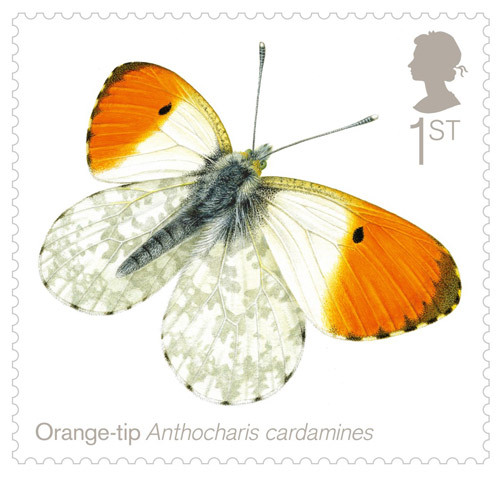 Royal Mail features at least one set of stamps on wildlife each year, and in recent years has chosen to highlight the plight of threatened species by promoting them on the post. 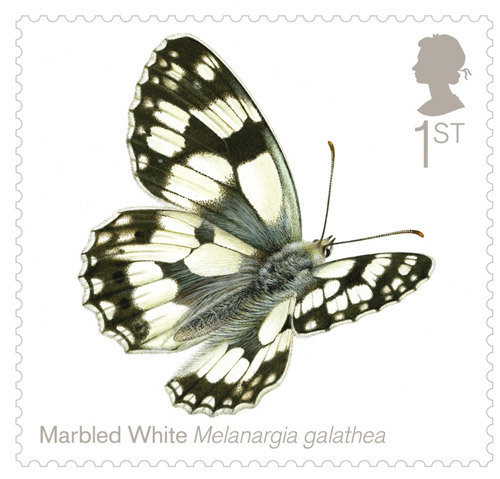 Many butterflies are in decline in the UK. Three quarters of UK species have decreased in either distribution or numbers over the last 10 years. 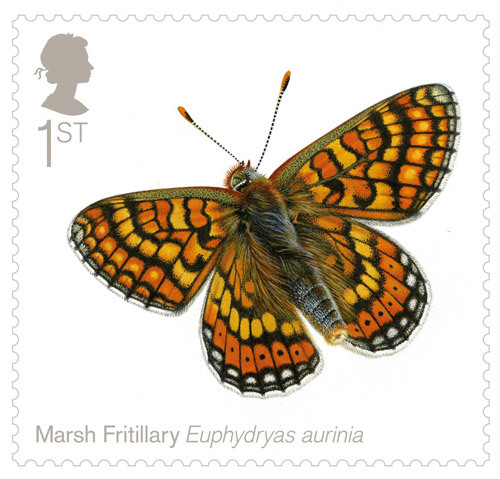 However, intensive conservation efforts have increased a number of threatened species, such as the Marsh Fritillary, featured in the set. 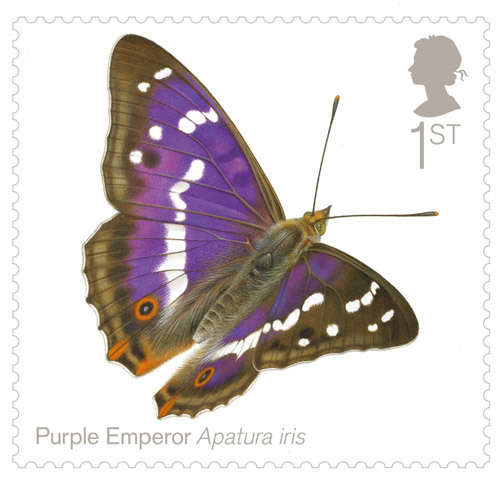 The yearly nationwide survey, the Big Butterfly Count, takes place from 20 July–1 August, 2013. 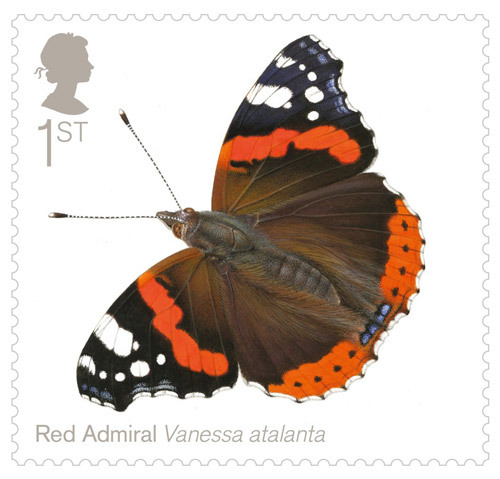 The full range of Butterflies stamps and products are available from Post Offices across the UK, online at www.royalmail.com/butterflies, and by phone on 08457 641 641. 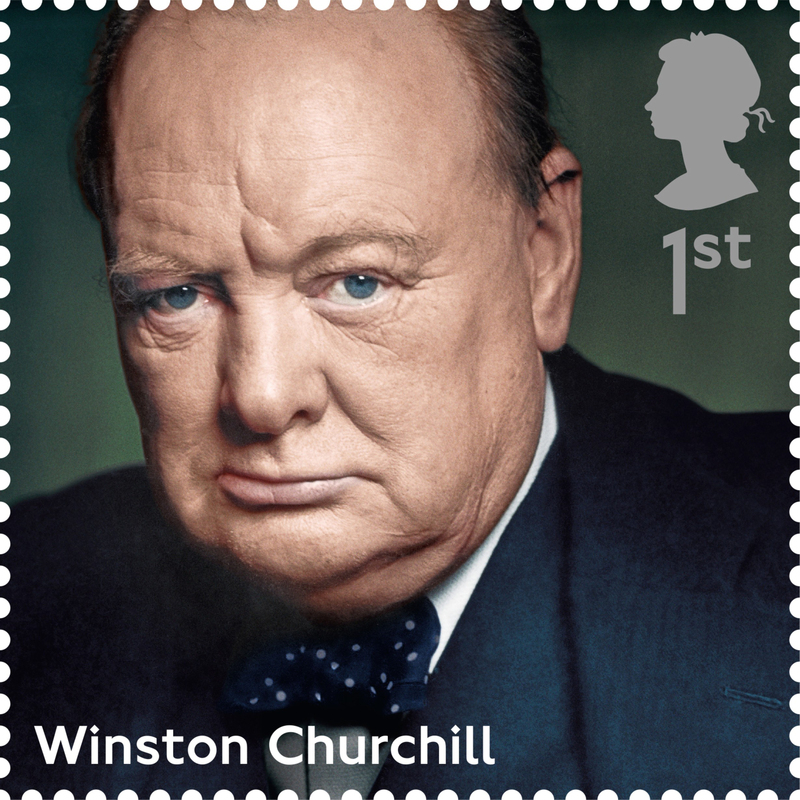 Royal Mail is today issuing a set of ten 1st Class stamps celebrating some of Britain’s greatest individuals and their achievements. Entitled ‘Great Britons’, the stamp issue celebrates individuals across sport, journalism, music, politics and the arts whose anniversaries of birth or outstanding achievement fall in 2013. The set of Great Britons stamps, issued 16 April 2013. World renowned actress Vivien Leigh, famous for her leading roles in Gone with the Wind and A Streetcar Named Desire, takes centre stage alongside actor Peter Cushing, who is perhaps best known for his roles as Baron Frankenstein and Doctor Van Helsing in horror films produced by Hammer Film Productions. Vivien Leigh, 1913-1967 – Stage and film actress. 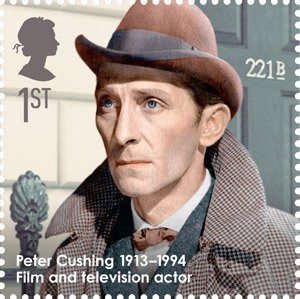 Peter Cushing, 1913-1994 – Film and television actor. 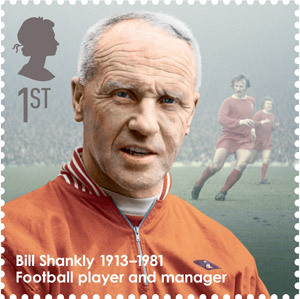 From the world of sport, Scottish footballer and manager William ‘Bill’ Shankly features. Regarded as one of football’s most successful and respected managers, Shankly was manager of Liverpool from 1959 to 1974, leading them to triumph as First Division champions in 1964, 1966 and 1973, FA Cup winners in 1965 and 1974 and UEFA Cup winners in 1974. Bill Shankly, 1913-1981 – Football player and manager. Notable figures from the world of politics are also featured with the first and only Welsh Prime Minister, David Lloyd George, and John Archer, the first mayor of African-Caribbean descent, to head a London Metropolitan Borough Council in the collection. 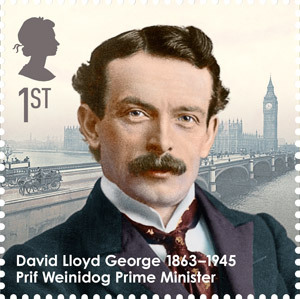 David Lloyd George, 1863-1945 – Prif Weinidog Prime Minister. 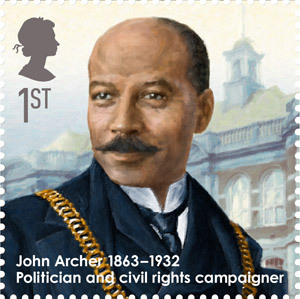 John Archer, 1863-1932 – Politician and civil rights campaigner. One of the UK’s best loved classical composers Benjamin Britten is included in the ten, with celebrated portrait and fashion photographer Norman Parkinson bolstering the arts contingent. 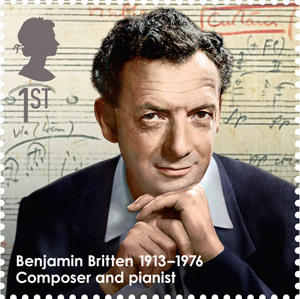 Benjamin Britten, 1913-1976 – Composer and pianist. Norman Parkinson, 1913-1990 – Portrait and fashion photographer. Richard Dimbleby, the well known journalist, broadcaster and father of David and Jonathan Dimbleby, is included within the set of 1st Class stamps, as well as celebrated cookery writer Elizabeth David, who was credited with introducing post-war Britain to ‘exotic’ Mediterranean cooking, featuring ingredients such as avocado, pasta, olive oil and red peppers. 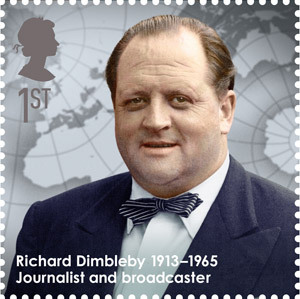 Richard Dimbleby, 1913-1965 – Journalist and broadcaster. 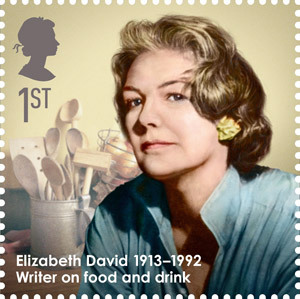 Elizabeth David, 1913-1992 – Writer on food and drink. Completing the ten is eminent archaeologist and anthropologist, Mary Leakey, who was credited with forcing scientists to re-think their long held views on human evolution thanks to her significant discoveries. 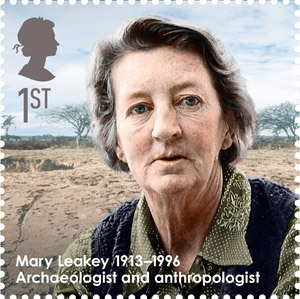 Mary Leakey, 1913-1996 – Archaeologist and anthropologist. 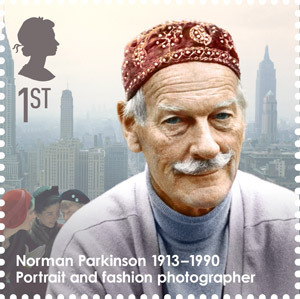 Writer and journalist Nigel Fountain has written the accompanying presentation pack, which provides an overview of the lives of the Great Britons featured on the stamps. The Great Britons stamps and stamp products are available at most Post Office branches, online at www.royalmail.com/stamps and from Royal Mail Tallents House (tel. 08457 641 641), 21 South Gyle Crescent, Edinburgh, EH12 9PB. Tomorrow is the birth centenary of Alan Turing the mathematician, logician, cryptanalyst and computer scientist who was highly influential in the development of computers and artificial intelligence. 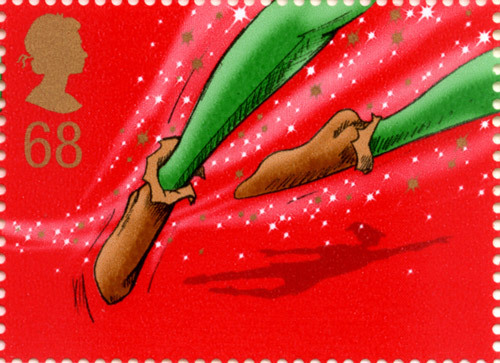 A stamp from the Britons of Distinction issue, 23 February 2012. 1st Class – Alan Turing. Turing is perhaps most famous for his work during World War 2 at the code breaking centre in Bletchley Park. There he and others broke a number of German codes, including that of the Enigma machine. At Bletchley Park Turing worked with a number of engineers seconded from the General Post Office’s engineering department, including Gordon Radley and Tommy Flowers. Radley and Flowers were both involved in the development of Colossus, the world’s first programmable electronic computer, which broke the Nazi’s Lorenz codes and convinced General Eisenhower to go ahead with D-Day. While Alan Turing was not directly involved in the development of Colossus his work fed in to the thinking behind it. After the war Gordon Radley returned to the Post Office where he was involved in the development of the first transatlantic submarine cable, the invention the hearing aid, and projects to mechanise post sorting which led to the development of the postcode. He eventually rose to become Director General (Secretary to the Post Office), the first engineer to do so. Tommy Flowers also returned to the Post Office after his time as a code breaker, where he was involved in developing the pioneering electronic telephone exchange at Highgate Wood, and ERNIE, the random number generator used by Premium Bonds. Alan Turing’s post-war work and legacy are even more significant. Until his death in 1954 Turing undertook pioneering work in computer development and programming, mathematical biology and morphogenesis. He also developed the “Turing Test” for artificial intelligence, which states that a machine can only be said to be intelligent if its behaviours are indistinguishable from that of a human being. 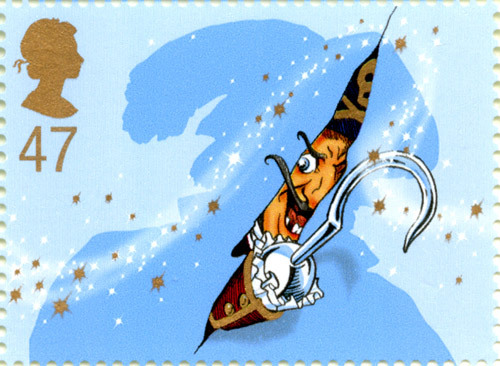 A stamp from The Inventors’ Tale issue, 12 January 1999. 63p – Computer inside Human Head (Alan Turing’s work on computers). For this and his many achievements Alan Turing is often labelled a “genius”. 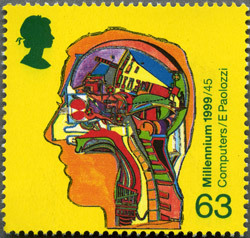 A stamp from 1999, part of The Inventor’s Tale issue, is testament to this: it features E Paolozzi’s artwork Computers, portraying a computer inside a human head. It is one of many of Paolozzi’s artworks inspired by Alan Turing. 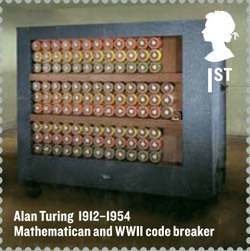 A stamp released earlier this year (pictured above) as part of the Britons of Distinction issue commemorates Turing’s work as a mathematician, computer scientist and code breaker. The stamp shows Turing’s “Bombe” code breaking machine at Bletchley Park. 2012 is Alan Turing Year, celebrating the life and work of Alan Turing. Mr Bumble, Mr Pickwick and Mr Micawber are all instantly recognisable creations of Charles Dickens, one of Britain’s greatest novelists. To commemorate the bicentenary of Dickens’ birth Royal Mail is celebrating his life and work of with ten new stamps issued today. 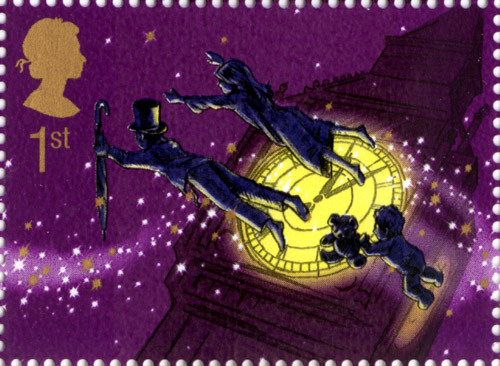 The stamps feature iconic characters from some of Dickens’ most famous novels, including Mr Bumble from Oliver Twist, Mr Micawber from David Copperfield and Captain Cuttle from Dombey and Son. 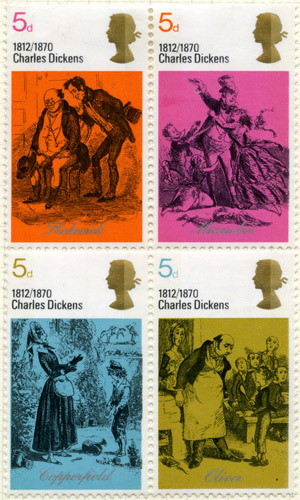 Six of the stamps feature original illustrations adapted from Character Sketches from Charles Dickens, by Joseph Clayton Clarke (otherwise known as Kyd) and originally published around 1890. 2nd Class – Mr Bumble – Oliver Twist; 1st Class – Mr Pickwick – The Pickwick Papers; 77p – The Marchioness – The Old Curiosity Shop; 87p – Mrs Gamp – Martin Chuzzlewitt; £1.28 – Captain Cuttle – Dombey and Son; £1.90 – Mr Micawber – David Copperfield. 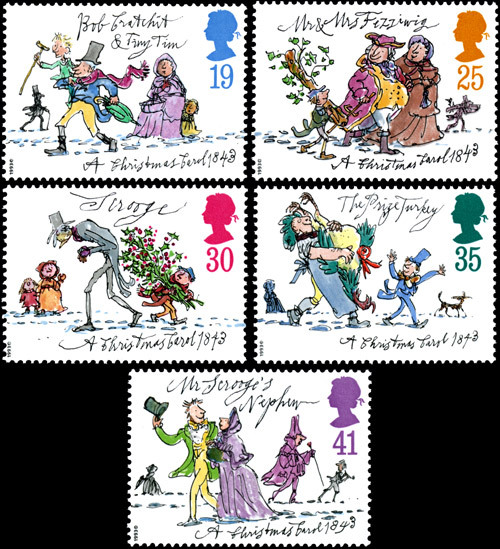 Royal Mail is also issuing a miniature sheet of four stamps of illustrations by Hablot Knight Brown (known as Phiz), who illustrated ten books by Dickens. 1st Class – Nicholas Nickleby; 1st Class – Bleak House; 1st Class – Little Dorrit; 1st Class – A Tale of Two Cities. The presentation pack that accompanies the issue is written by Lucinda Dickens Hawksley, who takes a look at her great, great, great grandfather’s life and works. 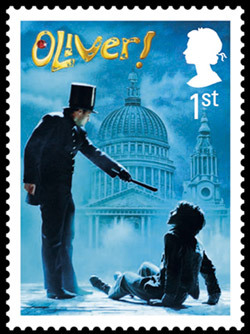 Charles Dickens or his work has appeared on three previous stamp issues: Literary Anniversaries (1970), Christmas (150th Anniversary of A Christmas Carol, 1993) and Musicals (Oliver! 2011). Four stamps from the Literary Anniversaries issue, 3 June 1970. 5d – Mr Pickwick and Sam Weller – Pickwick Papers; 5d – Mr and Mrs Micawber – David Copperfield; 5d – David Copperfield and Betsy Trotwood – David Copperfield; 5d – Oliver asking for more – Oliver Twist. 150th Anniversary of Publication of A Christmas Carol by Charles Dickens issue, 9 November 2011. 19p – Bob Cratchit and Tiny Tim; 25p – Mr and Mrs Fezziwig; 30p – Scrooge; 35p – The Prize Turkey; 41p – Mr Scrooge’s Nephew. 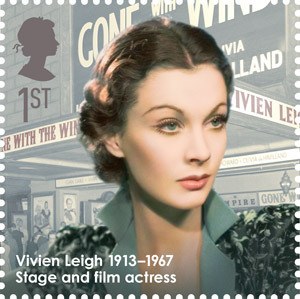 A stamp from the Stage Musicals issue, 22 February 2011. 1st Class – Oliver! 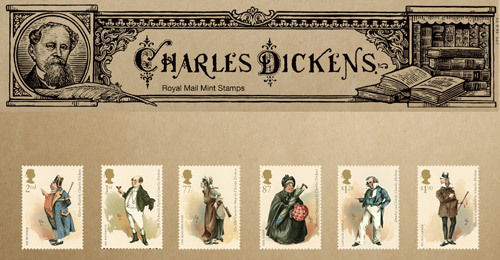 Two first day of issue handstamps are available with the new Charles Dickens stamps. 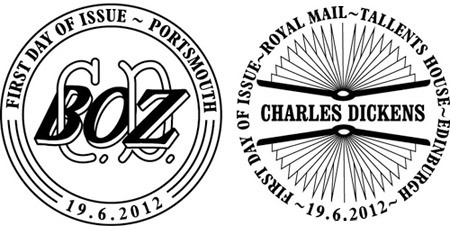 One features Dickens’ initials and Dickens’ sometime pseudonym “Boz”, the other features a book design. Charles Dickens first day of issue handstamps. The Charles Dickens stamps and stamp products are available at all Post Office branches, online and from Royal Mail Tallents House (tel. 08457 641 641), 21 South Gyle Crescent, Edinburgh, EH12 9PB. Two Charles Dickens Coaching Prints from our collection can be viewed on Flickr. Royal Mail is marking the culmination of Her Majesty The Queen’s Diamond Jubilee celebrations with eight new stamps featuring significant events over the past 60 years. The Diamond Jubilee stamps are issued today in time for the extended Jubilee Bank Holidays on 4 and 5 June. 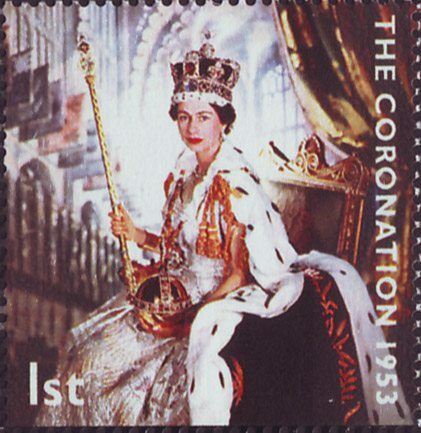 Issued in four se-tenant ‘pairs’, the stamps use archive photographs showing The Queen performing her official duties both at home in the UK and on the world stage. These include such diverse tasks as the first televised Christmas broadcast in 1957, to Her Majesty’s inspection of the 2nd Battalion Royal Welsh, as head of the UK’s Armed Forces, half a century later in 2007. 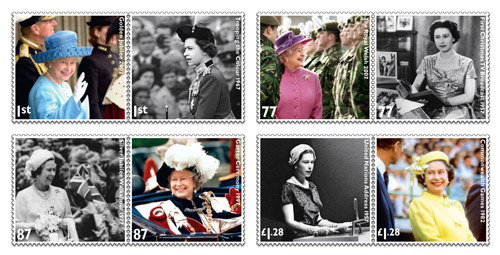 The Diamond Jubilee stamps are: 1st Class – Golden Jubilee 2002, Trooping the Colour 1967. 77p – The Royal Welsh 2007, First Christmas TV Broadcast 1957. 87p – Silver Jubilee Walkabout 1977, Garter Ceremony 1997. £1.28 – United Nations Address 1957, Commonwealth Games 1982. These stamps demonstrate The Queen’s devotion to duty since her accession to the throne on 6 February 1952. Much of this is recounted in a 24-page prestige stamp book written by Daily Mail journalist Robert Hardman that is also being issued to celebrate the Diamond Jubilee. 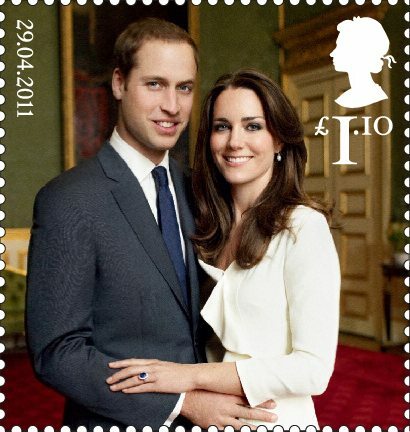 This is the third and final Royal Mail stamp issue in 2012 to mark The Queen’s Diamond Jubilee. The first was The House of Windsor issue (2 February), which featured a 1954 portrait of The Queen. 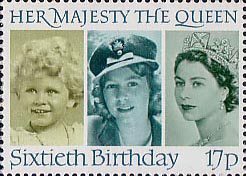 The second, the Diamond Jubilee Miniature Sheet, was issued on 6 February, the same day The Queen came to the throne in 1952. 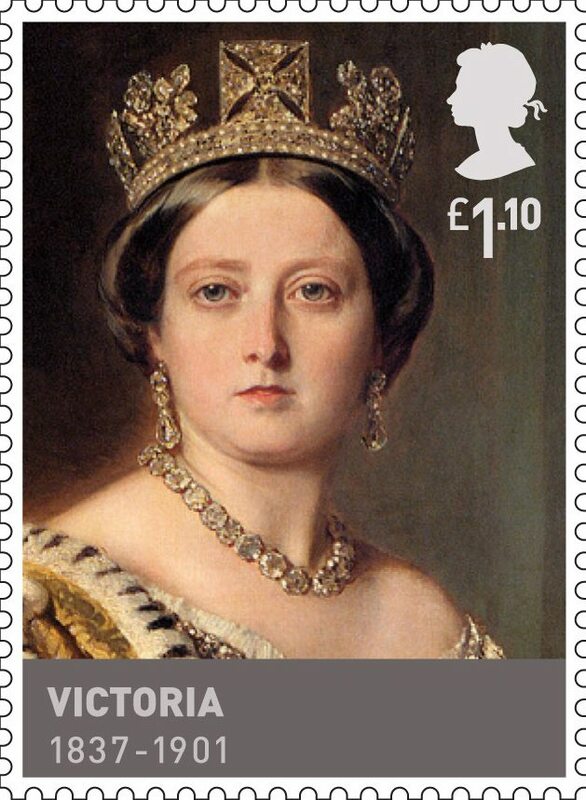 Two first day of issue postmarks are available for this issue, including one featuring a depiction of a royal coach. A display of philatelic material celebrating the Diamond Jubilee, including an exclusive insight into the making of the stamps released to mark the occasion, can be viewed free of charge at the Royal Mail Archive, London. Jubilee Stamps Designer Kate Stephens and Royal Mail Design Manager (Stamps & Collectibles) Catharine Brandy will discuss Designing the Diamond Jubilee Stamps at the Phoenix Centre, London on 27 September. Tickets are £3/£2.50 concession, please book online. 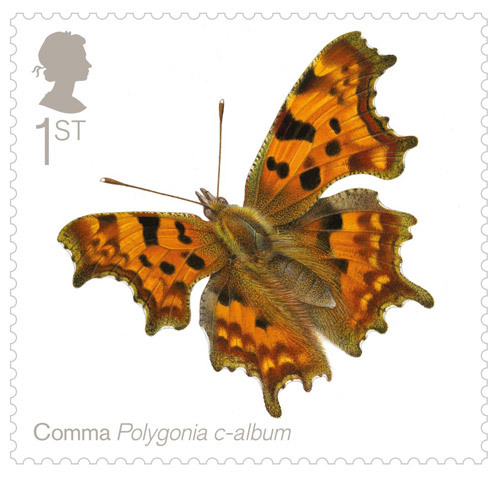 The stamps and stamp products are available at all Post Office branches, online and from Royal Mail Tallents House (tel. 08457 641 641), 21 South Gyle Crescent, Edinburgh, EH12 9PB.